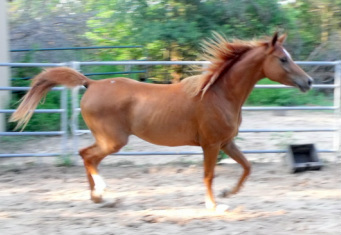 Shah Hisan (Ibn Hisan x HSA Tasha) -- flashy chestnut with big, dark eyes. Beautiful, athletic & correct, Shah shows great potential for sport horse, trail, show, endurance or as a family pleasure mount. Flashy copper color with flaxen mane, white star & 3 socks. Loads of charisma & a "show off" personality! His heritage includes *Morafic, Raffon, *Talal, El Hilal, *Maligg & many more ... beauty, athletics, disposition & trainability. Smart, willing & eager to please, Shah is a gem ready to be polished; waiting to begin whatever activities or competitions you choose. His dam was a multi-Champion Class A halter mare & his sire was a versatile ranch, trail & pleasure driving horse. Shah could do anything his new owner desires, with a happy attitude ... will work for carrots, or just a "good boy" caress. SOLD 8/13/11 -- congratulations to Karrin Cooper of Allen, TX! Shah Hisan is now in training. We look forward to hearing all about his career under saddle.